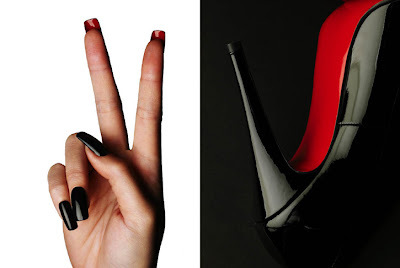 How fab is this Louboutin inspired manicure? Unfortunately I can't remember where I saved this image from, but I think it's perfection. I've been meaning to invest in a leather skirt for a while. Now I officially need one in my life. My favorite shoe silhouettes all wrapped up in one pretty little package (t-strap, wedge, platform). Loving the drama and fearlessness of this ensemble.